After a quick Venezia break to bring you a bit of Central Saint Martins inspiration, we are back on our biennale grind, and ready to share some more of our favourite moments with you. As I mentioned previously, the main venues for this international event are the Giardini, (a beautiful garden dotted with various exhibition halls and country pavilions), and the Arsenale (a complex of former shipyards and armories for which construction began as early as 1104). The latter, perhaps due to its’ age and history, has a very majestic feel to it, and witnessing such a multitude of art within its’ antique walls is truly special. 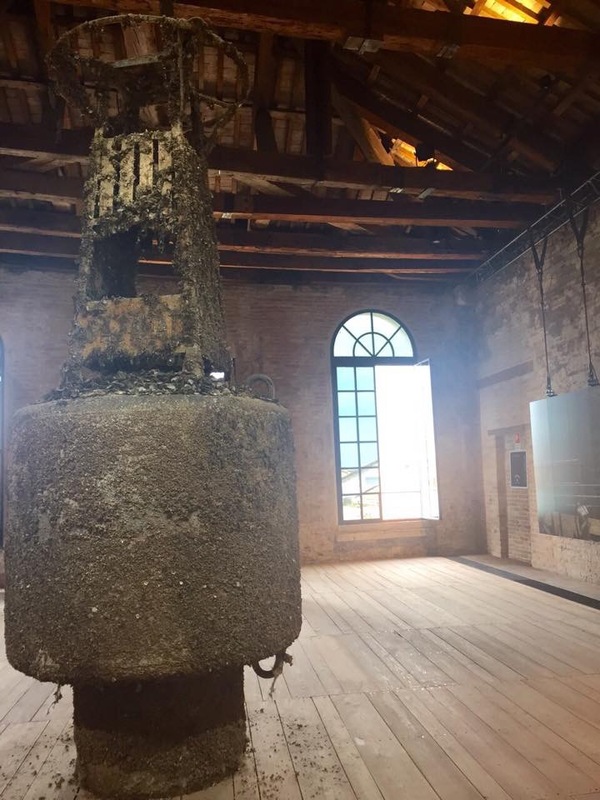 Like the Giardini, the Arsenale houses both specific country pavilions and a general ‘All the World’s Futures‘ exhibition, showcasing multiple international artists and curated by Okwui Enwezor. I suppose the major difference between the two spaces is that while the Giardini feels light and airy — no doubt because of its’ outdoor setting — the Arsenale gives off a much more severe vibe, leaving less room for dillydallying and daydreaming, and hence producing, in my view, a more focused and intense experience. The armory itself also feels endless, with art around every dark corner, and even outside rising from the canal (Chinese artist, Xu Bing‘s ‘Phoenix Project‘ and Brazilian Vik Muniz‘ ‘Lampedusa‘ to name a few). Walking through the exhibition feels something like making one’s way through a maze — you tread carefully so as to not miss anything, and yet you deliberately plough forward too, with the pulsing goal to make it out the other side. Magical in the way the main sculpture feels so at home in the space, the exhibit’s focus is on something from deep within the sea — rotted with age, covered in mollusks — which is not unlike the Arsenale itself. The view of the blue waters outside and ship-like feel of the wooden floors make for a really thoughtful and unique experience. 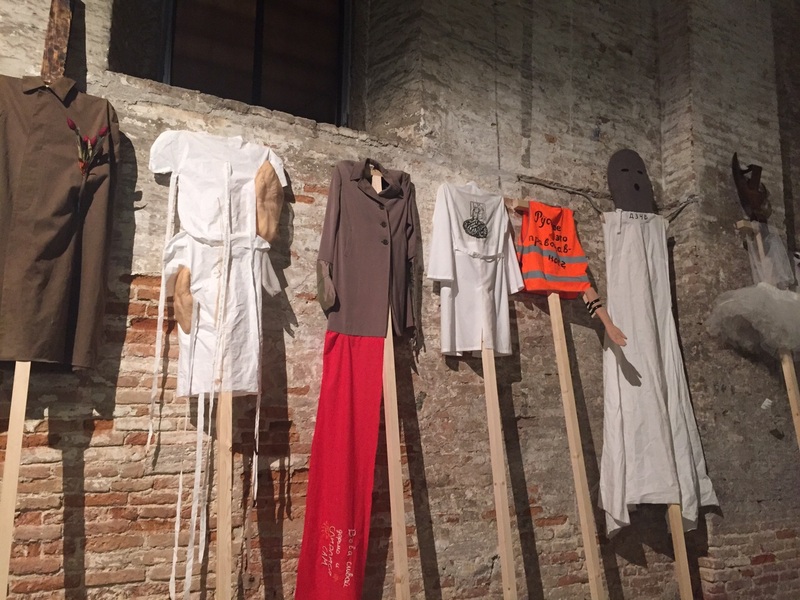 Simple and powerful, the giant picket signs adorned with clothing tower tall against the old brick walls, and span the length of the building making for a menacing and moving work of political art. This may be, in my view, the most gut wrenching piece in the whole space. 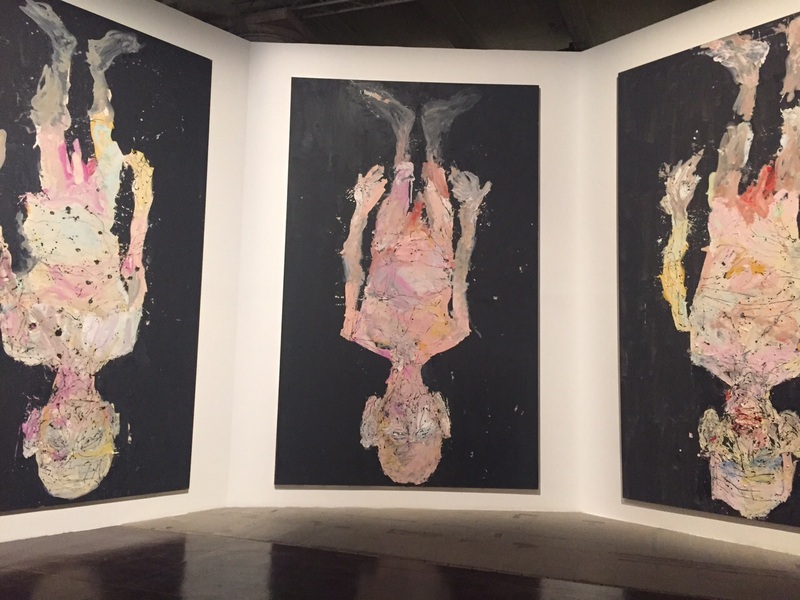 I adore Baselitz’ work so these paintings were a welcome sight. Plus, I felt joyously upside-down by this point in the day so I I could really relate! 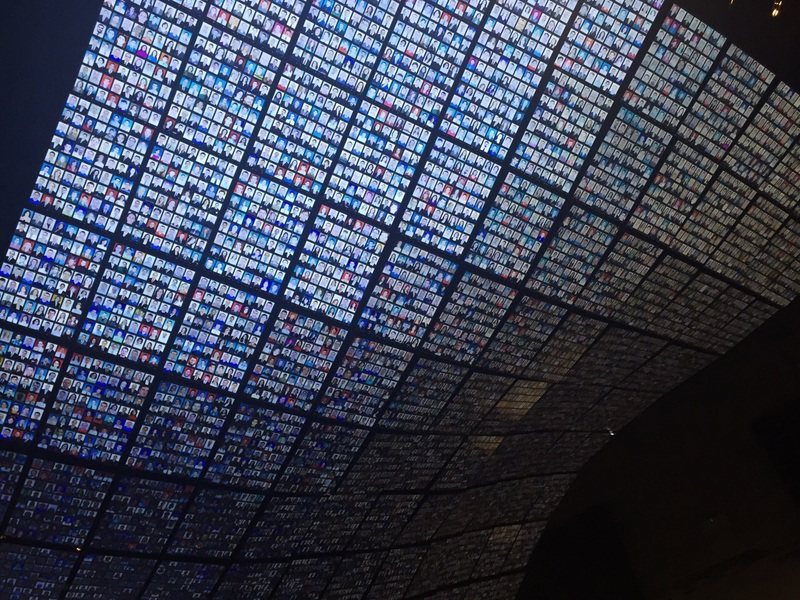 Made up of 9,216 LCD panels, this piece towers hauntingly above viewer’s heads, begging one to look up at what our world has become — a cacophony of tiny images that make up the whole. Simply breathtaking. 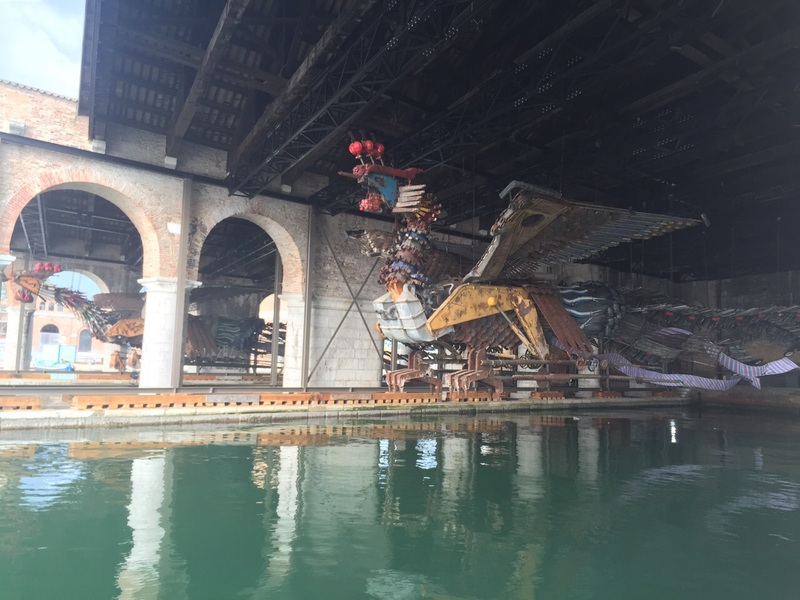 Officially the biggest individual works of art in all the biennale, these 2 creatures tower high as the dock ceiling, rising like glorious ships from the musty canal. Impressive and mighty, these birds really do look like they could take off and fly at any moment. Another powerful political statement is Vik Muniz’s giant paper boat. 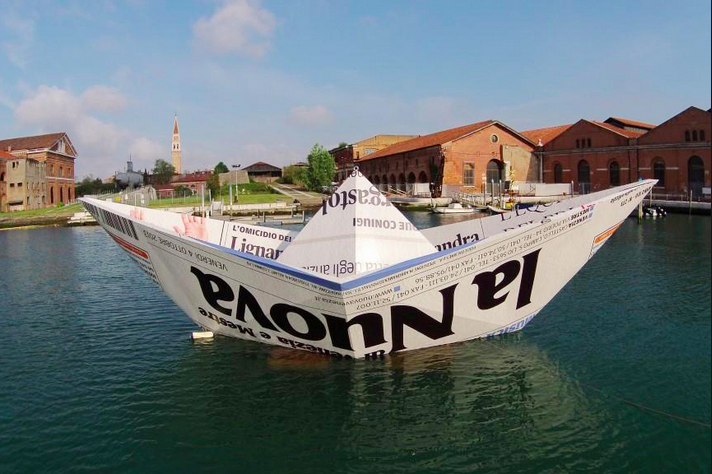 The floating work is covered in blown up newspaper clippings from Italy’s 2013 migrant tragedy. If you recall, a boat full of Libyan migrant workers fatefully capsized off the coast of Sicily’s Lampedusa and left 360 dead. Watching the childlike boat gracefully bob in the canal is both haunting and moving. Sometimes, we forget that some of the best art is beautiful — no gimmicks, grand statements or overt messages — just utterly and inarguably beautiful. The Turkish pavilion is a welcome reminder of this and a pleasant shift from much of the other art in the Arsenale. 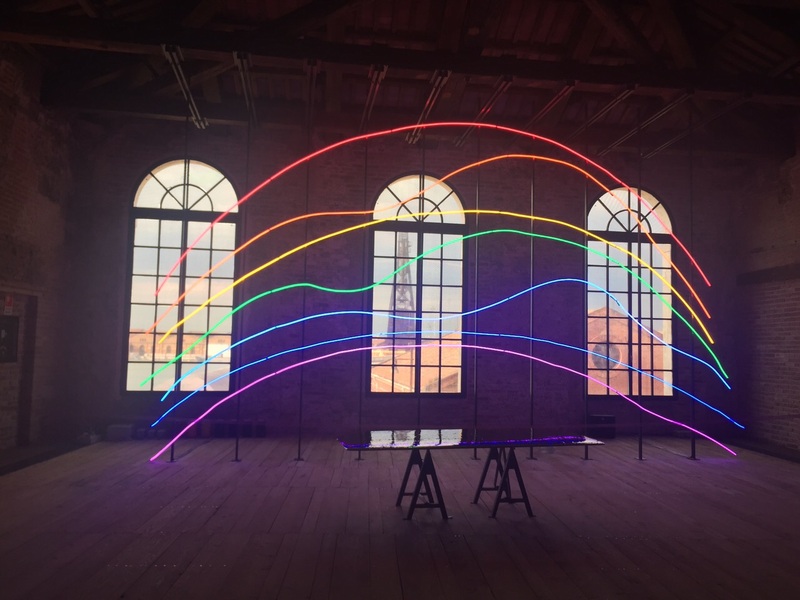 In fact, my colleague and I did not want to leave the twisted rainbow overlooking Venezia and lingered inside for what seemed like a welcome eternity. Despite not knowing the title nor the artist of this work, it is one that has really stuck with me. Perhaps there is not much to it, but its’ message is clear and one to stand by always. 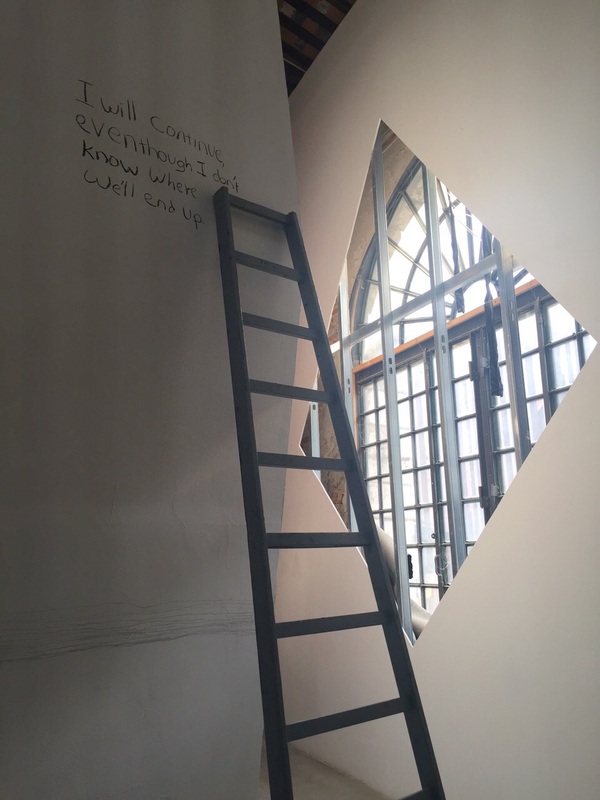 We must all keep climbing! 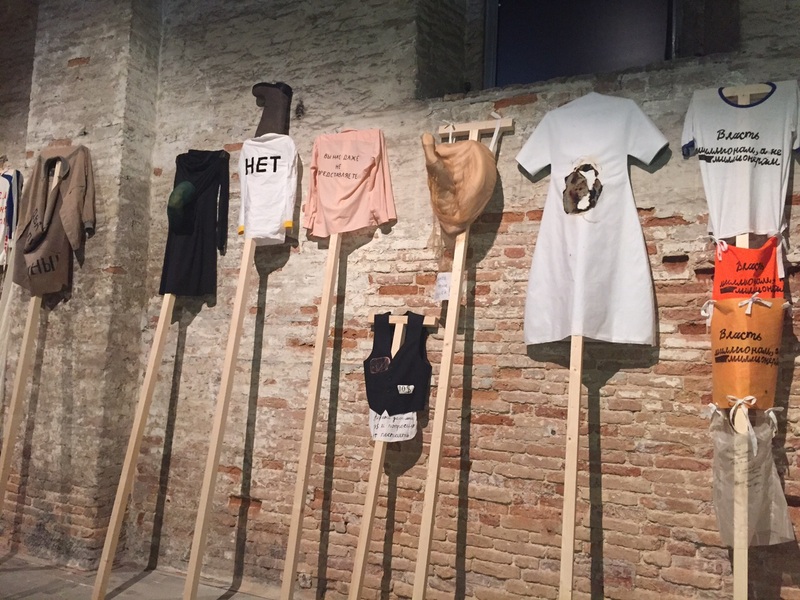 Biennale Arte 2015 is on view throughout Venice until 22nd, November 2015.